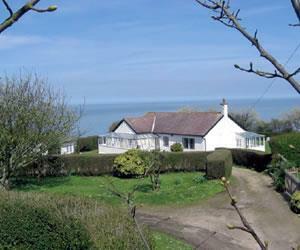 Buckthorns01406 422953work Self-cateringSpacious seaside bungalow in an idyllic and secluded cliff top position. Set in one acre gardens with spectacular sea views from most rooms. Three bedrooms. Fully equipped kitchen with dishwasher. Overstrand's village pub, shops, hotels and cafes within walking distance. Golf nearby. Sleeps 6. Spacious seaside bungalow in an idyllic and secluded cliff top position. Set in one acre gardens with spectacular sea views from most rooms. Ground floor bedrooms. Children welcome from any age. From Cromer; join the road to Overstrand. Continue along (not into the village) until you pass the coast road on the left. Just before the Sidestrand sign you will see a white 5-bar gate on the left - turn immediately before the gate into a narrow driveway signed to Buckthorns.